For all of us who love Mexican food, we strive to learn how to make burritos. Most of us just accept the idea that they are a traditional Mexican food. The truth is that this is one of the more modern versions of “Mexican American” food originating along the border of United States and Mexico. Before learning how to make burritos, the people of Mexico would often use a tortilla much like we do a slice of bread here in the United States; place a piece of meat or some vegetables on it and roll it up to eat. This was a very quick and easy snack when one got hungry. When learning how to make burritos, you will find them a little more time consuming than simply wrapping a “piece” of something in a tortilla or piece of bread. The best flavors come by combining several ingredients in a tortilla. Some of my favorite ingredients start with chicken, meat and seafood; of course meatless ones can also be very delicious. 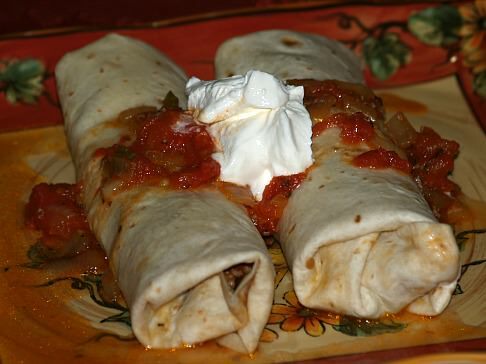 Breakfast burritos have also become very popular and are a favorite on special buffets. I top my meat with combinations of the following: rice, beans or refried beans, chopped fresh greens, chopped fresh tomatoes, spicy guacamole, salsa, sour cream and always some shredded Cheddar cheese. For breakfast burritos, you must have scrambled eggs, some type of breakfast meats, salsa, sour cream and any of your favorite toppings. One thing I must warn you about is to use the LARGE tortillas because they can get very large with all your delicious fillings. Watch me make homemade tortillas! NOTE: You could add or substitute the meat with shrimp or other seafood in these recipes. CHICKEN BURRITO RECIPE Learn how to make burritos with chicken. Cook onion and garlic in oil about 3 minutes stirring occasionally until onion is tender crisp. Stir in chicken broth, chili powder, salt and pepper; reduce heat and cook about 10 minutes. Spoon about 1/3 cup of chicken mixture onto center of each tortilla. Fold one end of tortilla up about 1 inch over mixture; fold right and left sides over folded end. Fold remaining end down; place seam side down on ungreased baking sheet. VEGETARIAN BURRITO RECIPE Learn how to make burritos without adding meat. Preheat oven to 475F degrees; lightly oil a shallow roasting pan. Combine in a bowl the bell peppers, onion, zucchini, lemon juice, oil, oregano and a pinch of the salt and pepper. Transfer the vegetable mix to the roasting pan and roast for 20 to 25 minutes 8until tender crisp. In a stainless steel saucepan, coarsely mash half of the black beans with scallions, chipotle chiles, garlic and cilantro. Cook mixture over moderate heat while stirring until thoroughly warmed about 6 minutes. Heat a large cast iron skillet or griddle over moderate heat; heat the tortillas one at a time until just softened. Transfer the tortillas to plates and pile the bean and vegetable mixture on top. 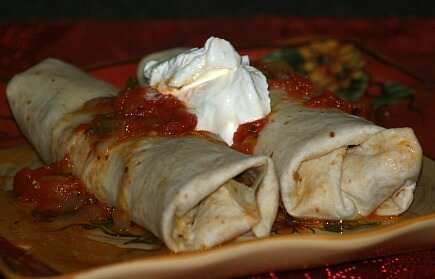 Sprinkle the cheese over top of mixture and roll up tortillas; top with tomatoes and serve. 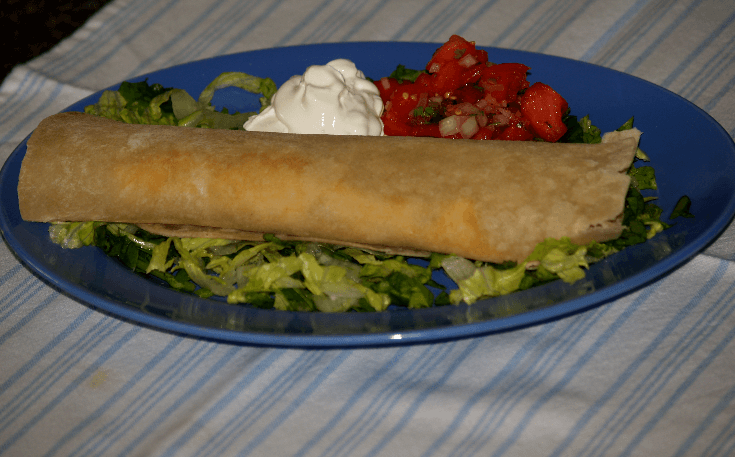 Learn how to make burritos with round steak. Heat vegetable oil in a Dutch oven over medium high heat. Add steak pieces and cook 3 to 4 minutes stirring constantly. Add peppers, tomatoes, onion, cilantro and salt. Cover, reduce heat and simmer for 1 hour or until meat is tender. Heat tortillas according to package directions or prepare homemade. Spoon about 1/3 cup of meat mixture down the center of each tortilla using a slotted spoon reserving the tomato gravy in skillet. Roll up tortillas and place seam side down on each plate. spoon pan sauces over tortillas; garnish with sour cream. Learn how to make burritos for a delicious breakfast. Brown sausage in a large skillet stirring until it crumbles; drain. Add eggs and chiles to the sausage. Cook without stirring until mixture begins to set on the bottom. Scrape a large spatula or spoon across the bottom to form large clumps of the mixture. Continue cooking until eggs are thickened but still moistened; DO NOT STIR CONSTANTLY. Spoon egg mixture evenly down center of tortillas. Top each with Picante sauce, cheese and jalapeno peppers. Fold opposite sides over the filling and serve immediately. Learn how to make burritos with this flavorful recipe for ham and cheese breakfast burritos. Combine and whish together milk, eggs, salt and pepper. Place butter in lightly greased 10 X 15 inch jelly roll pan. Place in 400F degree oven until butter is melted. Pour egg mixture into pan; sprinkle evenly with cheese and remaining ingredients. Bake mixture and tortillas at 400F degrees for 8 to 10 minutes or until egg mixture is set.